Plot Four, Chemin de Moulin Casse, Perybere, Mauritius. Grasses grow around my knees, insects persist my feet. Parceled between tourist developments in the north of the island, this plot teems with funereal mounds of waste, the few remaining punctuations of bird wetland habitat in the midst of a sea of concrete, bricks, plaster and paint, in an incrementally theatricalized version of a paradise. 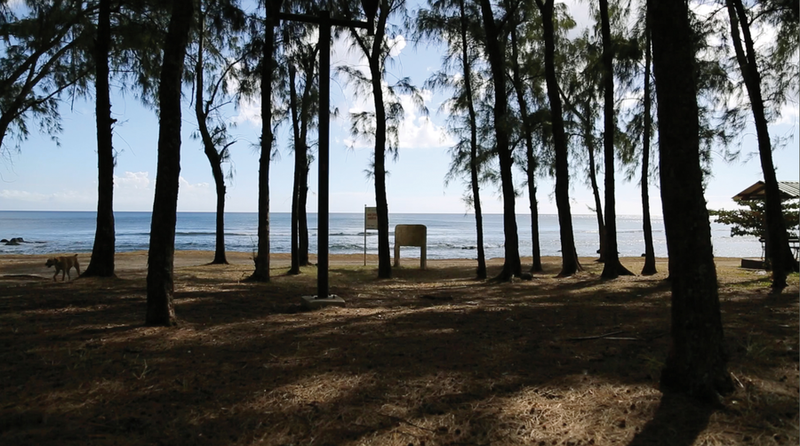 From a small parcel of wasteland in Mauritius, owned by her family, Chong Kwan travels in real, constructed and animated landscapes, in search for the sole remaining member of a species of palm, the hyophorbe amaricaulis, or 'the Loneliest Palm', which is at risk of the same fate as that of the island’s Dodo. The work moves between documentary, day and night-time imaginings, simulacrum, the sublime, construction and waste, and ends with a haunting childhood song by the artist's 99 year old Great Aunt, herself the last of a generation.